While I disagree with the title of a recent Huffington Post article proclaiming that “Everything is Different Now” in parenting, I do agree that many things have changed. • A higher level of parent involvement is required for academic success. In the old days, the primary educational duties for parents were reading to your kid and making sure they got into a good school. There was a high level of trust and respect for external authorities -you assumed that teachers and principals knew best and operated with the best interest of your son or daughter in mind. With sophisticated Internet “research” projects assigned in elementary grades and developmentally inappropriate organizational skills required in middle school, the student whose parents don’t step in to offer hands-on guidance may easily be left behind academically. • A college degree offers diminished opportunity for a secure middle-class life. In the old days, if your kid got into college they could probably find a job. These days it’s not just about grades, SAT scores, and college admissions-the level of young adult underemployment and debt suggests that bargain is broken. • Children are more sheltered and given less freedom to learn independence. … there is a lot less unsupervised play and less unstructured summer roaming. Given rational safety concerns, most kids are more sheltered and scheduled and less like to explore and learn independence…. I disagree that this trend has been driven by “rational” concerns, unless he means the concerns that parents will run into trouble with CPS. • Learning options have expanded. … There has been a linear increase in formal education options and an exponential explosion of informal learning options. • Higher education costs have exploded. … The bad news is that most post-secondary education is more expensive than ever. The good news is that there are more options…. The message of the documentary film Most Likely to Succeed is that these and other changes cry out for “another transformation” in education. “What I find shocking is that schools aren’t preparing our kids for life in the 21st Century. Surrounded by innovation, our education system is stuck in the 19th Century,” said Ted Dintersmith, producer of Most Likely to Succeed. “The skills and capabilities our kids need going forward are either ignored or outright trampled.” Ted’s movie outlines the broken bargain of a traditional college prep education and employability. Dintersmith criticizes that students have to learn “regurgitated facts” and take traditional tests like the SAT. He offers alternatives. Invent a science experiment, write a creative essay, come up with an interesting historical perspective on an event they care about. The point that Dintersmith and others seems to miss is that facts serve as the basis for innovative scientific experiments and knowledgeable historical perspectives. This inconvenient truth is at the core of the trouble with many education reforms. Students need a broad base of knowledge before they can become critical thinkers. Tom Vander Ark, “Everything is Different Now: Parenting for Powerful Learning”, Huffington Post, March 25, 2015. Tom Vander Ark, “Most Likely To Succeed: A Film About What School Could Be”, Education Week, March 6, 2015. In an interview with Deseret News, cognitive scientist Daniel Willingham elaborates on the importance of background information in the development of reading comprehension skills. DN: You talk a lot about “background information” as a key reading skill. This seems to be an enormously important concept that is not often discussed? Willingham: I strongly agree. Once you spell it out it is sort of obvious to people that in all communication — speaking as well as writing — that we don’t make explicit every detail needed to comprehend. If you did, communication would take forever. You assume that your reader has certain knowledge. We have to connect ideas, sometimes within a sentence or across sentences, and very frequently information is omitted. If you don’t have the right information in a voice conversation, it’s not that big a problem. You can ask them to clarify, or dumb it down. But when you’re reading you don’t have that option. And what will happen is you will just stop reading because you don’t comprehend. Nonfiction reading is important in building background information. DN: You write that we are shortchanging our reading by focusing so heavily on language arts. What do you mean by that? Willingham: That’s absolutely true in the early grades. There is very little time devoted to science or civics or history or drama or art. English language arts focuses very narrowly on narrative fiction, and a lot of the time they’re not even reading. They are doing writing and spelling. It’s not that these things are not important, but we have to recognize that later on, in middle school and high school, the lack of background knowledge is going to come back and bite our kids. Schools have an even greater obligation to teach background information to low-income and minority students. DN: This seems to have important implications for closing the achievement gap suffered by low-income and minority kids? Willingham: Absolutely. The kids coming from wealthier homes have much richer resources to acquire that broad background knowledge. They’re much more likely to be immersed in it at home, and their parents have more money, which they can use to provide experiences that are rich in information. Willingham’s latest book is “Raising Kids Who Read”. Among other recommendations, he advises that parents avoid using baby talk with their children. Eric Schulzke, “What parents can do at home to prepare their children to read”, Deseret News, March 22, 2015. High school prepares a student for college, and middle school in turn prepares him for high school. Grown & Flown has created a concise list of middle school tips that allow “kids to perform at their best and enjoy their four years to the fullest”. Here’s the first bit of advice. I would make sure, if possible, that my child was above average at a sport, music, art or another activity. Not get-recruited-at-a-D1-school good, but get-picked-for-the-JV-team good. Part of high school is finding your place and that is much easier to do if you are selected for the orchestra or given a role in the school play. I know educators advocate the benefits of being well-rounded, but competence and accomplishment breed self-esteem and social well-being. While I agree with this idea, in reality it can sometimes be really hard for a middle-schooler to find his “one thing”. Many kids are still trying out activities, and as much as parents try they may not be able to make them stick with just one or two. Sometimes the reasons are legitimate, but sometimes a lack of persistence is the cause for a young person’s fickleness. Parents should keep guiding and emphasizing the importance of practice and hard work, but some kids still never find their one thing until later in life. Don’t despair, because the counter argument is “that if you want to raise a really successful child, you should let them quit things”. No doubt, there are many paths on the road to success. Here is the rest of the list, and for more details you can go to the Grown & Flown site. What percentage of college students have disabilities? During the 2011-12 school year, students with disabilities comprised 11% of college enrollment. Here is the distribution of the types of disabilities from 2008-09. The all others category includes audio, visual, and language impairments, as well as autism. HEATH can be a resource for prospective college students with disabilities. Some colleges provide extra support services. Almost all colleges provide some level of services for students with disabilities. The American Educational Guidance Center provides a list of some that “go a step further…they offer programs, some quite comprehensive, designed to support students with learning disabilities”. Most learning disabled college students are no longer receiving the type of support services they did during their K-12 years. Along with “18-year-olds’ natural inclination to go it alone”, another problem is finances. Many college disability centers require documentation of a student’s learning disability. A set of tests used to verify whether a student has a disability, necessary for those who have no documentation or haven’t been tested before, costs as much as $5,000, according to academic-support and disability-services coordinators at several colleges and universities — a price tag K-12 schools pay but many higher-education institutions won’t. It’s probably safe to say that most college professors are not knowledgeable about instruction for learning disabled students. Matt Krupnick, “Colleges respond to growing ranks of learning disabled”, The Hechinger Report, February 13, 2014. A recent study demonstrated the potential of mindfulness-based curriculum in helping young students improve academic and social skills. While mindfulness-based approaches for children have become popular in recent years, few are backed by rigorous scientific evidence. The research team — graduate research assistant Simon Goldberg; outreach specialist Laura Pinger; and CIHM founder Richard Davidson, the UW-Madison William James and Vilas Professor of Psychology and Psychiatry — set out to change that. The team developed a curriculum to help children between the ages of 4 and 6 years learn how to be more aware of themselves and others through practices that encourage them to bring mindful attention to present moment experience. These practices, the researchers hypothesized, could enhance the children’s self-regulation skills – such as emotional control and the capacity to pay attention — and influence the positive development of traits like impulse control and kindness. Past studies show the ability to self-regulate in early childhood predicts better results later in life with health, educational attainment and financial stability. Flook says early childhood is an opportune time to equip children with these skills since their brains are rapidly developing. The skills may also help them cope with future life stress. “Knowing how critical these skills are at an early age, if there are ways to promote them, it could help set kids on a more positive life trajectory,” says Flook. Mindfulness techniques are scaled down for preschoolers. The curriculum itself is rooted in long-standing adult mindfulness-based practices but was adapted to the children’s developmental ability. The results showed improvements in delayed gratification, attentiveness, and task switching. In addition to gains in academic performance, students demonstrated “less selfish behavior over time and greater mental flexibility”. While these results are promising, “larger studies are needed to demonstrate the curriculum’s true power”. I look forward to more studies that support existing research indicating that mindfulness improves our ability to focus and “may be better than medication in treating ADHD”. Their labeling of this method as “kindness curriculum” is a turn-off to me, but perhaps it has broad appeal to most parents. Kelly April Tyrrell, “Kindness curriculum’ boosts school success in preschoolers”, University of Wisconsin-Madison News, Jan. 23, 2015. By teaching them “facts”, schools can make a difference in helping bring kids out of poverty. … the facts, concepts, theories, and principles that are taught and learned, rather than to related skills—such as reading, writing, or researching—that students also learn in academic courses. When it comes down to it, E.D. Hirsch would argue that it’s mostly facts that end up separating rich kids from poor kids. He says its facts like the meaning of “common denominator” or understanding what an “ombudsman” does or knowing who Geronimo was that offer many middle- and upper-class students—who learned the terms at home and in their community—a clear advantage in life, while their poorer peers often miss out on absorbing this basic cultural knowledge. “Facts are what you need to read properly, and to learn more, and to communicate,” says Hirsch, author, founder of the Core Knowledge Foundation and professor emeritus of education and humanities at the University of Virginia. In 1987, Hirsch wrote the book on teaching facts: Cultural Literacy: What Every American Needs to Know. It was hailed as innovative, but also criticized as being “elitist, Eurocentric and focused too heavily on rote memorization”. Now, at 86, he’s seeing the teaching philosophies he’s championed for nearly 30 years becoming a basis for curriculum changes in schools across America. Reading comprehension is dependent on background knowledge. The new standards are promising, but success depends on proper implementation. As for how Common Core standards might change what students learn in schools, Hirsch says he’ll reserve any enthusiasm for when he sees how the standards are put into place. Carrie Madren, “The Facts of the Matter”, University of Virginia Magazine, Winter 2014. Weaker math skills are creating problems for America’s M.B.A. applicants. New waves of Indians and Chinese are taking America’s business-school entrance exam, and that’s causing a big problem for America’s prospective M.B.A.s. Why? The foreign students are much better at the test. Asia-Pacific students have shown a mastery of the quantitative portion of the four-part Graduate Management Admission Test. That has skewed mean test scores upward, and vexed U.S. students, whose results are looking increasingly poor in comparison. In response, admissions officers at U.S. schools are seeking new ways of measurement, to make U.S. students look better. The GMAT, administered by the Graduate Management Admission Council, is typically required to apply to M.B.A. programs, along with undergraduate transcripts, essay responses and letters of recommendation. Students at top programs like Harvard Business School and Stanford Graduate School of Business have mean GMAT rankings around the 96th percentile. Of the test’s four sections—writing, integrated reasoning, quantitative and verbal—admissions officers view results from the quantitative section as a key predictor of business school success. One solution is to create lower standards for American students. To address those concerns, GMAC in September introduced a benchmarking tool that allows admissions officers to compare applicants against their own cohort, filtering scores and percentile rankings by world region, country, gender and college grade-point average. 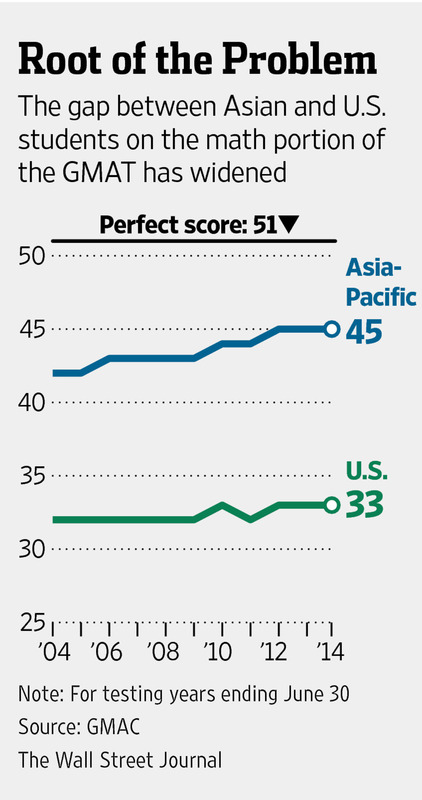 Lindsay Gellman, “On B-School Test, Americans Fail to Measure Up”, Wall Street Journal, Nov. 5, 2014. The New York Times Motherlode blog asks the question, “To A.P. or Not to A.P”? Students, parents, and school administrators have mixed feelings about A.P. classes. Students sometimes feel pressured to take these advanced courses even when it’s not appropriate, but in many cases taking at least a few A.P. courses is the right decision. When taught well, A.P. and I.B. courses can offer high school students the opportunity to study college-level material while in high school. Administrators and teachers may be divided on the merits of offering A.P. courses, but they agree that secondary schools feel pressure to offer them to appear academically rigorous. A.P. courses usually look good on college applications. Selective colleges want to know if students have taken the “the most rigorous academic program available”, so the natural inclination is to take as many A.P. classes as possible. While some experts advise students that more is not necessarily better, it’s hard to believe that in a competitive situation more high A.P. scores will not add points on a college application. Students and parents often blame the Ivy League and other selective colleges for perpetuating the current cutthroat environment, insofar as such schools advise taking “the most rigorous academic program available” (as stated on the University of Virginia’s admissions website). “What parents are saying is that ‘until colleges change their message, I’m not going to let my kid be the sacrificial lamb,’ ” Pope observes. But colleges say it’s the literal interpretation of this advice that gets students into trouble. A.P. courses can be the appropriately challenging level of study for advanced students, and a way to avoid being bored in classes that are too easy. Students can earn college credit for A.P. courses when test scores are above a certain level. This can save money and time, even enable graduation in less than four years. In some cases colleges do not give credit, but use A.P. test scores to allow a student to skip over introductory classes. This can be a benefit, but in some cases students should still take the lower-level college class. For example, a STEM major may wish to take the college calculus course as a way to establish a stronger foundation for advanced course work. For some students, A.P. classes add excessive stress, either because of the extra work involved or because the student is not prepared to perform at the higher level. In these cases, the lower-level course is the more appropriate placement. There are borderline cases, where the question is whether it’s better to get an A in a regular college prep course or a lower grade in an A.P. course. The answer that most colleges will give you is that, it’s better to get an A in the Honors/AP class. Well, of course. And most highly selective colleges will expect that you do. But in reality, most colleges would rather see a B in an Honors or AP course. They want to see that you are truly challenging yourself, but that you are still mastering the material…. The decision to take or skip A.P. courses is not always easy. Consider it carefully. ADDED: Gas station without pumps blog gives commentary and advice on How many AP courses are too many? Probably the most reasonable course is for students to take AP courses (and exams!) in those subjects that most interest them and pursue interests outside the AP classroom. Community college courses that go beyond the AP courses are also a cost-effective choice, if you can get in. Jessica Lahey, “To A.P. or Not to A.P., That Is the Question”, New York Times, November 13, 2014. Amy Brecount White, “Under Pressure”, Arlington Magazine, September-October 2014.